With planning and creativity, almost any structure can be retrofitted with passive solar design elements. This home underwent a passive solar retrofitting process to become the efficient, sunlit structure that it is today. Originally placed on the property in 1948, it was a drafty 1-story Quonset hut that was likely purchased from the army shortly after World War 2. In the retrofit, the house was lifted, angled and thermal mass, mainly with the addition of adobe, was added throughout the new base of the structure. The hard work has paid off in the form of a lovely, efficient passive solar house. On a good sunny day in the winter the owner says, “It doesn’t matter how cold it is outside, the natural gas forced air heater does not start until during the night.” He keeps his thermostat at 72 degrees. 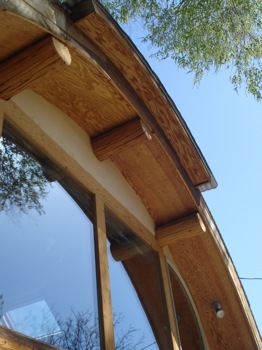 This passive solar retrofit highlights the use of adobe within a traditional stick frame build. Salvaged and recycled materials were used whenever possible. The front of the property that faces the street has been xeriscaped. Facing the north, it also shows the shading on the property. The original Quonset hut was both raised on jacks and turned, in order to angle the building’s glazing (glass) toward a more southern facing direction. The house is located in a city that is oriented 45 degrees diagonal to the regular directions. The builder, in angling and turning the whole house, moved the solar glazing as much as possible toward true south, while adhering to the city code setback of 5 feet from the edge of the property. It is currently 15 degrees east of true south. 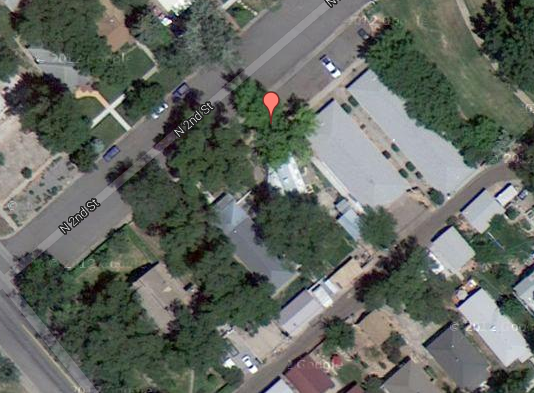 Here’s a bird’s eye view of the house. See how it’s angled a bit differently from the other houses? The view from the south looking into the house. 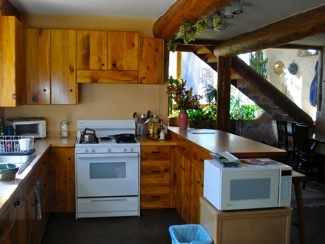 The kitchen is to the right hand side, and the back wall is made of adobe bricks. The inside of the house is comfortable with graceful and custom features. The owner/builder took care to find and use materials that could be salvaged. All the logs seen throughout the photos have been recycled, salvaged from their former life as telephone poles. This view shows the view into house from the greenhouse. There are steps from the greenhouse that descend to the main living area. The house was designed so that on the winter solstice, the sun’s heat energy is able to strike and be absorbed into the back adobe brick wall. The adobe bricks were simply painted over and are a nice patterned surface in the home. Adobe has been used extensively throughout the house. Adobe is a sustainable, green building material, since all it consists of is hardened mud (dirt + water). The house has a one foot thick adobe brick wall perimiter that surround the building on the ground floor. The house has also been sunk three feet into the ground. This helps the building maintain a stable temperature. The ground floor is poured adobe mud, sealed with boiled linseed oil. The adobe floor took about 6 coats of linseed oil, as it was applied until the adobe would not absorb any more. All the bricks used in the wall for the ground floor, over 1500 of them, were made during one weekend with the use of a rented brick compressing machine. Steve described this adobe brick-making-machine as a type of hydraulic ram that squashes damp dirt together to make uniform size bricks. The benefits to this process were that the dirt from the property was used (creating the space to sink the building 3 feet) the adobe bricks were quickly made, and were uniform 12” by 4” size bricks. The bricks were stacked on palates for later use. By that time that the walls were built, the bricks had dried, so to give them some moisture they were plunked into water, then the brick was simply pushed into place. 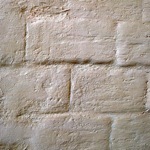 An adobe mortar was used in between the brick layers while an adobe plaster covers the inside of the walls. Salvaged, recycled barn wood was used to make the kitchen cabinets. The wood shows character from its former life as it weathered the elements outside. Some of the barn wood was difficult to work with because the pieces were irregular and warped, while others were burnt, and of varying thickness. The patterns and character within the old wood, however, are original and add an aesthetic dimension that can not be rivaled when compared with plastic wooden laminate products. A view from the upper story of the Quonset hut showing the curved top with recycled cedar planks, looking toward the greenhouse. Throughout the upper story of the house, gleaming cedar planks, grace the curving walls of the Quonset hut. They were formerly the exterior siding of a house, salvaged before the house was destined for demolition. While it is really rewarding to use and know that materials were salvaged and recycled, he adds a few words of caution, saying that the process of building with salvaged materials can add another layer of difficulty to the building process. Salvaged materials can sometimes be free, yet extra time must be spent in gathering and transporting the salvaged materials, then shaping them into usable products. For example, instead of going to the hardware store and purchasing what is needed to immediately install, the wood needed to be first taken off of the house, hauled, then straightened, sanded and finished before installation. 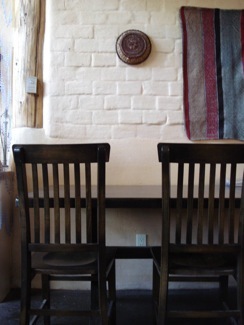 Tip: While beautiful and rewarding, using salvaged materials can sometimes take additional time and effort. Here is a view of the upstairs section looking in the opposite direction, turning away from the southern facing glass and into the back bedroom. The drywall ceiling was dropped and is likely using the logs as part of its support. 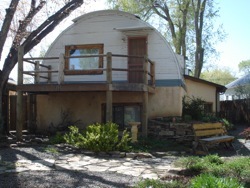 It’s also important to keep in mind that this passive solar house works (it stays warm in the winter and cool in the summer) both because of its thermal mass and because spray-in foam insulation was attached to the inside of the metallic quonset hut dome helping to insulate the structure. 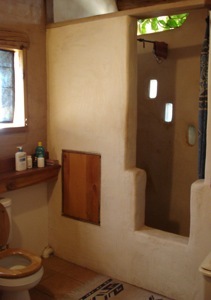 Earthship-style construction with cans and cement were stuccoed in to form the walls of the shower. 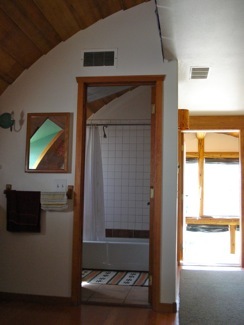 The bathroom on the lower level shows the rounded edges of the shower’s wall. They were made with earthship-style construction. Underneath the adobe stucco layer are aluminum cans set in cement. The concrete adds thermal mass, while the aluminum cans create space, while recycling a product. The translucent glass bricks that let light into the shower from the greenhouse are actually empty gin bottles. Steve jokes that it took him a long time to build the retrofit because he was working on getting all the materials in order to finish the house. Since the floor plan is open, with the bathroom being situated next to the greenhouse, there isn’t a fan in the bathroom, it simply vents out into the greenhouse. During the remodel, the inside was stripped down to its metal joists, then spray-in foam insulation was installed all along the inside of the domed structure. Recycled cedar planks cover the inside of the curved Quonset hut. The southern facing side of the structure houses a greenhouse with various types of plants both in planters and in the ground. The double paned glass (double glazing) that is used on the southern side of the house is a High-E type of glass. A higher E value (denoting emissivity) is a type of designation that indicates that the glass is more resistant to loosing heat from the inside to the outside. Insulated curtains are also used to help keep the heat inside the house after the sun goes down. 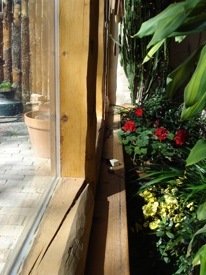 D logs were used to stabilize and place the glass. D logs are often used for building log cabins because they have a flat surface on three sides of the log, with an aesthetic outer-facing side that is curved. The D logs performed as nice, even surfaces to place the glass upon. 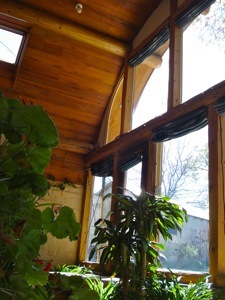 The windows are held in place on the outside with a strip of cedar. The overhang was calculated so that it would block the summer sun, but allow the winter sun to strike the one internal adobe wall located near the back of the house. In order to insulate outside of the thermal mass (the adobe bricks) the owner added a one inch thick layer of Styrofoam, then protected it with an outdoor stucco, durable for 30 years. 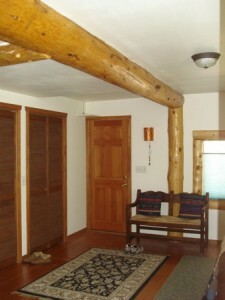 The dwelling is a traditional post and beam structure, with all the adobe being non load bearing. The owner-builder works a day job and worked on the house whenever he could. At one point, he stopped for a year. He is proud that no trees were downed in the process of building the house. The home is extraordinarily beautiful. I think people who live in quonset huts are totally whacked into genius. And to have adobe and log flavors makes the industrial look so many think is “modern” look cold and stupid. So, I also say extraordinarily beautiful and add warm and charming too. The owner-builder did a really nice job with the retrofit. It is, amazingly, cool in the summer and warm in the winter. I agree with you – ‘totally whacked into genius’! I am looking into also doing a retrofit.I have Questions? how do you keep the structor from sweating? does Spray foam keep the condensation out? How far out do you need to put the eaves for passive solar warmth in the winter? any additional information will be awesome. Thank You. When doing a retrofit, typically, the structure will become more insulated and air tight. 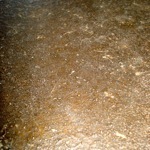 Moisture retention and sweating does become an issue. While sprayfoam will keep the condensation out, it will also keep moisture in the house – potentially causing condensation problems and mold. When doing a retrofit, it is important to install a system that will push moist air out of the house, while controlling the flow and temperature of the air that will inevitably need to enter a house. In regard to eaves or roof overhangs for the winter, you want to keep them short enough to allow sunlight and heat into the house. You also want them long enough to keep the summer sun out. Depending on where you live, this can be specifically calculated. Remember to have thermal mass (objects with density like brick, stone or tile) in the house to absorb the heat. I’m not quite sure what you’re asking about in regard to logs and trying to suspend the insulation? Insulation acts as insulation by residing next to a surface and trapping air to keep it from circulating, so it keeps a structure warm. 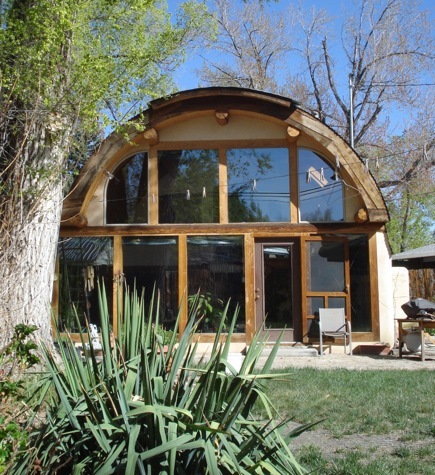 This quonset hut has insulation on the outside of the structure, outside of the thermal mass, then has a type of outside siding to protect it. Construction projects all tend to take quite a bit of time. It seems that the more organized a project is, the faster it can go. Some projects have taken years to finish, however, the farmhouse conversion, which was a lot of work: tearing down part of the old structure, adding mass (the brick wall), adding a second floor with an envelope convective air movement through the back of the house house, putting on a new roof – all took 2 months. Thanks again for all the information, where i am stuck at now is how to hang the drywall on the dome of the Quonset hut? i have looked at liquid nails, welding screws on but it just seems like i am not finding the best way, have any Ideas? Thank you for your information and time. Angela, I looked back at the original pictures, and it looks like in this retrofit, he dropped the ceiling on the second floor, so that the ceiling isn’t curved, but may have also used the logs to be propped up. I’m not sure exactly of what he used, but I’ve posted the picture of the ceiling on the second floor so you can see what it looks like. It’s right under the section about salvaged materials. Sorry that I can’t give specifics. I would like to cover one of my two Quonset huts with Earth – which would afford a more aerodynamic effect in the event of very high winds. This structure was built upon a 3.5′ concrete wall – on two sides and measures ~20 / 50 / 18ft high. It is a ribbed beam with 48″ centers. I may have to contact a structural engineer, but any suggestion you have would be most appreciated. I would first cover in heavy plastic and then begin to cover with dirt, on the sides (East and West) sloping at an angle of maybe 30 degrees. I just don’t know what the upper quadrant of the structure would take for depth of earth; to which I’d like to have maybe two feet or more. You should definitely contact a structural engineer. Dirt is heavy and depending on the quantity, it could overwhelm the structure of the Quonset hut and cause it to cave in. While a domed structure is strong, it can fail where the metal sheets have been joined together. Continuous domes are strong, but they will fail where they are bolted together. Also keep in mind that if you do decide to go forward, you will likely need to attach some sort of vapor barrier onto the structure, but the connections should also be protected in a way that not allow water in. (Dirt has a way of soaking up water.) The Quonset hut will likely have a metallic top that should be protected so that if water does get through, it will not cause the material to rust and further weaken. Depending on how much time is spent in the Quonset hut, you may want to consider how much oxygen and fresh air can circulate through the structure. If you plan on living in it, water vapor created from showering, cooking and other activities that create water, will need a way to escape or there may be problems with mold. If the overall envelope around the house is tightened with an air barrier, you may want to consider getting an air exchanger. It could be a really warm and cozy – Earth covered Quonset hut. Be sure to check with a structural engineer! Best of luck. This house is a great inspiration for me as I purchased a Quonset hut in Marietta, PA. It had been bank owned, vacant for over a year and had mold problems. A previous owner had covered the metal curved hut with a more traditional wood and shingled gambrel roof. The roof had ridge and eve vents, but the metal building underneath had no ventilation and this past summer at times it was like a sauna, so much moisture inside. I am in the process of taking everything out, soft soggy drywall, heavy rockwool insulation and the dropped ceiling. Not sure of what the completed project will look like but I definately want to keep the higher curved ceiling, about 10 ft. at it’s center. The rear of the house faces south and has a walk out basement, so should be ideal for a solar project. Interesting note: I was told this Quonset was once a chicken house, 36 ft. long by 20 ft. wide. Glad that you enjoyed the post on the Quonset hut. Amazing things can be done with them. Keep me posted if you decide to go solar. Best of luck! I have purchased a quonset that leaks. I would like to reside / roof the structure. What suggestions would you have? 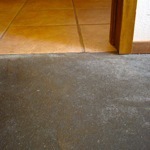 It had previously been coated with a painted or sprayed on product that is peeling in some spots but not others. Any suggestions? It is already on a basement foundation and the interior (except for the leak damaged areas) is fine. You definitely should make sure that the roof is waterproof as soon as you can, preferably before winter and because water tends to rot and ruin things. On a roof with seams throughout it, it can be tricky to find the actual place that is causing the leak (because water runs downhill on beams and often enters the house in a different place than the actual leak). If I were you, I’d first consult with a real builder – which I am not. But in looking at the differernt houses, one possibility would be to cover the whole thing with a layer of EPDM. Here’s a concrete house that has that kind of roof covering. EPDM (ethylene propylene diene monomer) is a type of rubberized membrane often used for commercial flat roofs. I’d find out if it would be possible to find an adhesive and find some way to seam seal it along the edges so that water can’t leak underneath it – otherwise you’d be in a similar situation that you’re currently in. Or, you may want to concentrate on sealing all of the seams with some sort of sealant. Paint typically is not a great way to waterproof something. Whatever was used before, if it is peeling, I’d recommend going with something else. I previously have used a clear rubberized roof sealant to fix a leaky roof. It came in a similar round can as paint does, but it had a thick, clear, gooey consistency. It really was stinky, but it stopped the leak in the roof. It took me two days of crawling on the roof, and I found out that – where the leak showed up inside was actually about 8 feet away from the actual leak, located by the stove chimney. I often take digital pictures and take the camera to the hardware store to show whatever predicament I’m in. Best of luck. If you can check back, let me know how you fixed it. If others have ideas, feel free to pitch in. Happy sealing! I am building a green Quonset hut. Wanting to put solar tubular skylights in hut. Any suggestions for style, fit, adaptations. Panels have deep corrugations, with widest surface being about 10 inches. I believe I can get an orientation and even make a sort of port hole modification if I can get a product that is small enough with flashing that can be modifiable to adjust to the panel. Most tubes come in 10″ but the hole opening is 11.8″. Did find an 8″ tube but no specs on roof opening and smaller ones don’t have vent option. Anyone have knowledge of products enough to problem solve? You may want to try this link: http://www.aiaindustries.com/circularskylights.html They have many different sizes and kinds of skylights. I too am wondering about the way the ceiling is supported; however, I am looking more specifically at the cedar planks. They are beautiful and add a warm feeling that would be great for an open loft. I am just worried that by attaching them to the actual structure would puncture the metal and open the possibility for leaks (no pun intended). Are they attached directly to the metal, or are they fastened to some type of wooden “stringer” that is fastened in the arch of the building. Any help or suggestions would be greatly appreciated! I heard back from Steve. When he bought the Quonset hut, it had masonite that made up the ceiling and walls. When he did the extensive remodel, he took off the masonite to find the 1″ x 1″ – 3″ furring strips (running horizontal to the metal ribs) behind the masonite. He did say that the furring strips were an assortment of various sizes, ranging in the aformentioned sizes. Before attaching the lovely cedar, foam insulation was blown in the space between the furring strips and the metal shell. The cedar was then attached to the furring strips, and not allowed to puncture the metal sheathing of the Quonset hut. I live in a leaky quonset hut in snow country. I have had the old foam removed from the roof. I have three bids on re-roofing. One – install plywood, then install shingles and/or membrane. On this one, I am concerned about the weight of the plywood and shingles plus the snow on a building that was built anywhere from 1940 to 1970. Second – spray foam the hut. Laying down a woven monofiilament material, spraying with Maxguard polyurea. Third – treating the rust. Spray form and top layer of moisture cured urethane top coat. I do not think any of this is considered “green” but after a lot of searching on the Internet, here I am and I could use your input. A few things come to mind. Without being familiar with your exact situation, these are just some things to take into consideration. If there’s rust, it would likely weaken the shell. I think that the rust would occur in the joints, or where different sheets meet, and that would be a point of potential weakness that should be explored before hanging a lot of weight onto the metallic shell. Definitely treat the rust. There are a couple of other considerations. Insulation is important. I think a spray-in foam would work well, as long as it is relatively light. In regard to the leaking roof, you should seal it up to make it a tight, efficient shell. A possible alternative that comes to mind is using ethylene propylene diene monomer (EPDM), the rubberized roofing material that is typically used for commercial buildings. 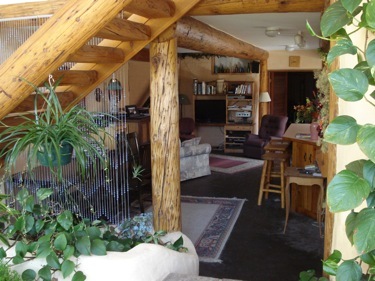 It was used in this post about a concrete passive solar home. Care would have to be taken so that moisture does not get into the grooves of the corrugated metal that would be underneath the layer of EPDM. Best of luck, and it would be cool to let us know what does work out. I will get back to you with the end results. Thanks for your quick response. I am planning on purchasing a quonset hut. Wanted to add prodex total insulation to the ceiling & walls then cover that with cedar planks. Is it possible to screw the planks directly to the steel? I wasn’t sure if I had to install wood beams first…. I’d recommend being careful with how the internal framing is attached, both for structural reasons and for making sure that the structure is adequately waterproofed. A Quonset hut gains strength from it’s curve, however similar to an egg, when the membrane is broken, it become weak. Make sure to consult with a builder that can see the existing structure and that understand what you are wanting to do with it. I’m not sure how you’re wanting to attach the planks to the steel, nor about the current state of the Quonset hut. It can potentially be a great space, but take care to get advice and good materials to make sure that the resulting structure remains strong.